The Pictograph Box. More commonly referred to as the Picto Box, this little gadget plays a particularly interesting role. The concept within the Legend of Zelda world is pretty original and unexpected for the supposed time period, and the clever, but arguably notorious, addition of the box to The Wind Waker greatly expanded the gameplay and quest options, albeit in a fairly lengthy, possibly grueling way. It is somehow pivotal but also oddly out-of-place in the games, which makes it a particularly amusing item in both gameplay and discussion. I am writing this article to discuss the significance of the device and its impact, and debate whether or not it was a quality addition to the franchise. Most, if not all of you, may know what the Picto Box is, but in case you haven’t played the games or you missed the side quests, here is some information. The item takes pictures, so it is like an in game camera. 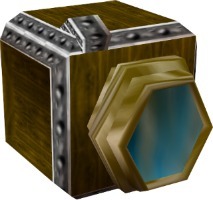 The Picto Box is first introduced in Majora’s Mask, which people may forget. It took sepia toned photos and could hold one photograph at a time. Using the device ultimately led to some random prizes, one of them being a Heart Piece. The box was then reintroduced in The Wind Waker but with a much more massive role. The box holds three photographs and originally takes the pictures in black and white. However, through the first side quest associated with the box, it can be upgraded to the Deluxe Picto Box, which takes color shots. It can then be used for a number of side quests with varying payoffs, and ultimately it can be used for perhaps the longest side quest of any Zelda game, the Nintendo Gallery figurine collection. With the announcement of the upgraded mechanics of the box in The Wind Waker HD, which you can read about here, this article seemed timely. 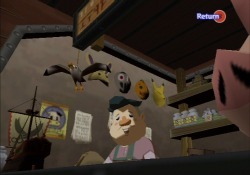 The very first, and only other, appearance of the Picto Box, which I was not even aware of until recently, was in Majora’s Mask. It is received after rescuing Koume, who runs the swamp tourist center where you can obtain two pieces of heart, one thanks to the Picto Box. It is later used as a very small part of a mandatory quest involving the Zora Eggs. Anyway, the impact and significance of this incarnation of the box pales in comparison to the the Wind Waker version in my opinion. In Majora’s Mask, it acts more like any other item, serving a purpose or two without going on to do anything major. Considering it can only hold one photograph, combined with how little it is used, if this were a winner or loser situation, this one would certainly be the loser. But you can’t be hard on it really. The idea was just then developed for the game. It’s not like they had time to make a lengthy, grand side quest that revolved around the item, nor did they really have the need or the game mechanics to have it store a higher number of images. Improving the device took some premeditation, and it must have paid off because we certainly got something that could be described as exactly a “lengthy, grand side quest that revolved around the item” in its next incarnation. It is a very simplistic item at this point. It has nothing dazzling about it. The photographs are in dull sepia tone. The device can be passed off rather easily with stats like that, but the idea was there. It could evolve, and it did evolve. Now on to a bigger topic. There is definitely more to say about The Wind Waker Picto Box. The location of the box you find in the game is pretty odd in comparison to how important it can be. It is also an odd destination considering how involved the man called Lenzo is with the device in general, but nevertheless, you find the box in Tingles jail cell after you free him, although you do have to get through a maze before obtaining it. Afterward, you do indeed meet Lenzo, a Picto Box enthusiast to say the least, and you become his “Research Assistant.” And through an admittedly exhausting process that involved taking three very specific pictures and catching an obscure firefly, you finally receive the full-color Deluxe Picto Box. Lenzo doesn’t seem to realize that maybe we don’t love taking pictures as much as he does. From there you get some easy quests, like taking a picture of the moon and of some people with the total payoff being three treasure charts and a much appreciated Heart Piece, but afterwards, you are faced with a perfectly optional but incredibly daunting task, the Nintendo Gallery figurine collection quest. If you are not familiar with the quest, see here. It would probably be best if I did not elaborate on it otherwise I might get lightheaded just thinking about how long it would take to complete. So enough of stating what you probably already know, it is clear that this Picto Box was an improvement. There really isn’t a debate there. I would prefer the Majora’s Mask version in terms of quests though because they had much more purpose than those of The Wind Waker. However, the developers definitely stepped up on the significance of the item while simultaneously keeping the dual purpose of fun. 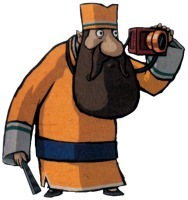 That is even more evident in The Wind Waker HD with how they have introduced a “selfie” function. You may have surmised my opinion on the Picto Box from how I am writing, although I try to be unbiased, but I am not a big fan of the item. It is more the quests that bother me rather than the item itself, but it is altogether not at the top of my list of Zelda items. I find its use and workings annoying overall and time consuming, not to mention Lenzo’s assignments that keep you waiting for an extended amount of time. The only other time I was as bored as I was when I had to wait for Garrickson to drop a love letter in the mail box was when I sailed from from Windfall to Forest Haven on the Great Sea without warping. Plus, I kept getting stopped by the awfulness that is Maggie’s Father, and I still managed to miss the shot three times. So I thought it kind of took away from the intensity of the game. It made you realize nothing was really that pressing so some of the thrill of the game was lost. Even going further, I can’t imagine someone having the time, the conviction, and the desire to complete Nintendo Gallery side quest. You would have to be very careful and very quick and reflexive all the time as not to miss any opportunities, and if you did miss something, it would be a nightmare I’m sure. Granted, you have a whole second quest to complete it, but still, one slip up, and you could be in serious turmoil. This is all also besides the fact you can only hold 3 photographs at a time. That sure is a lot of trips to the Gallery’s island. Besides that quest, the others aren’t so bad, but only by comparison. However, these statements are from an impatient guy. Don’t take my word for it alone. I am certain many people find the quest fun. 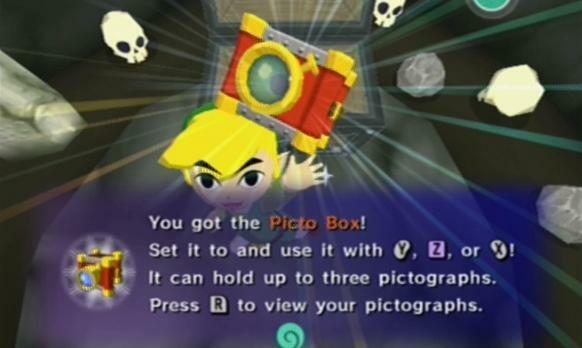 In conclusion I think the Picto Box was treated like too pivotal an item in The Wind Waker. Majora’s Mask set a good precedent for it to go off of, but it was then overused. I believe it took away from the experience. Unless you buckle down playing The Wind Waker for the shear purpose of completing all side quests, the Picto Box was played up a bit too much within the game. It was not a bad addition to the Zelda universe, but I could definitely live without it. So what do you guys think? Do you agree with me that the Picto Box is just kind of “meh”? Do you love it? Do you hate it? Is there a way they could have improved the quests associated with it? Give us some feedback, and thanks for reading!